It’s a logical step, but the recent decision by the University of Massachusetts to create a national online college is one that can perhaps best be summed up with that phrase risk/reward. Indeed, there are certainly potential rewards, but also some huge risks and certainly no guarantees of success with this planned enterprise. Like the school’s venture into big-time college football a decade or so ago, this move is certainly not as easy as it looks and will require a large investment, time, patience, and even some luck. More on that later, but first the ‘logical step’ part. 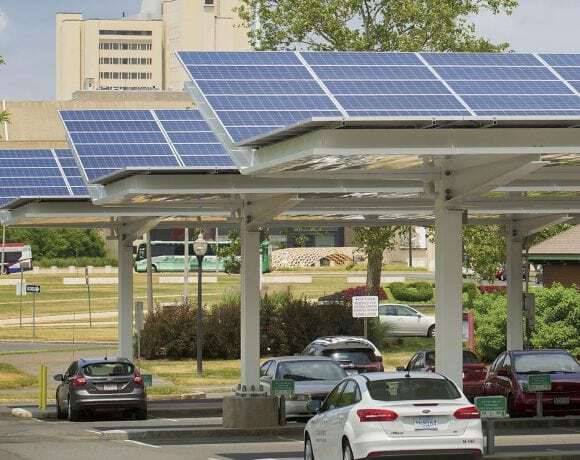 The announcement made earlier this month by UMass President Martin Meehan certainly makes a great deal of sense given recent demographic trends and other factors that are impacting almost every college in the country, large or small. High-school classes are getting smaller, and they’re going to continue to get smaller for at least another decade as families have fewer children. These smaller pools of high-school graduates are going to affect both smaller private schools like Hampshire College in Amherst and larger public universities like UMass, but in some ways, those public institutions will likely benefit from these demographic shifts as students and their families look for landing spots on firm financial ground. But it only makes sense for a growth-minded institution to look beyond traditional students and toward older adults (non-traditional students) seeking to continue their education or finish a degree program — individuals who are prime candidates for online learning because of its flexibility and convenience (specifically, the opportunity to learn from home). It makes so much sense that many growth-minded institutions are thinking along these same terms. In fact, UMass might actually be considered late to this party — although hopefully not too late. 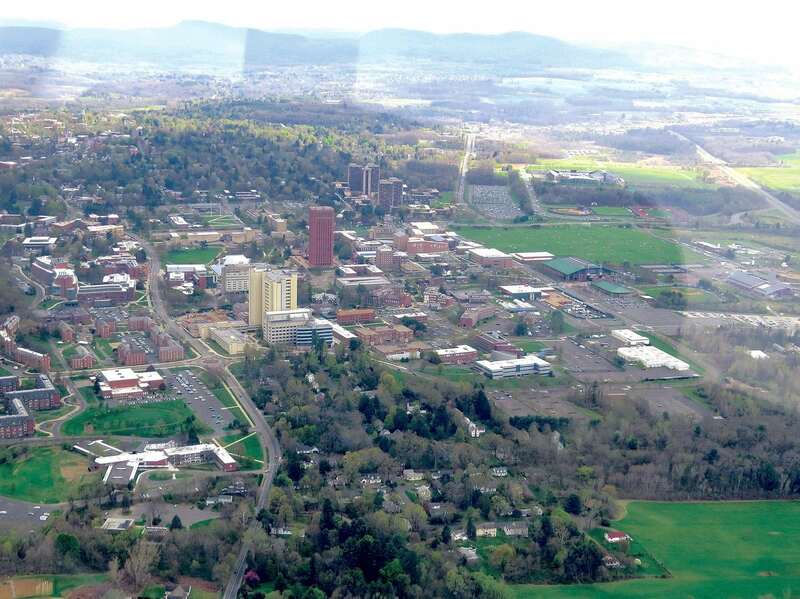 Several large institutions such as Purdue, Arizona State, and the University of Maryland have established highly successful online programs, as have some smaller schools, such as Southern New Hampshire University. And, right here in the 413, Bay Path University formed the American Women’s College, an online school that has helped change the fortunes of the former two-year college in a profound way. On the other side of the scorecard, however, several schools have launched online programs that have not met expectations, and still others have essentially scuttled their initiatives after years of high-cost underperformance. The bottom line is that online education programs are, contrary to public opinion, quite expensive, rather complicated, and immensely competitive. 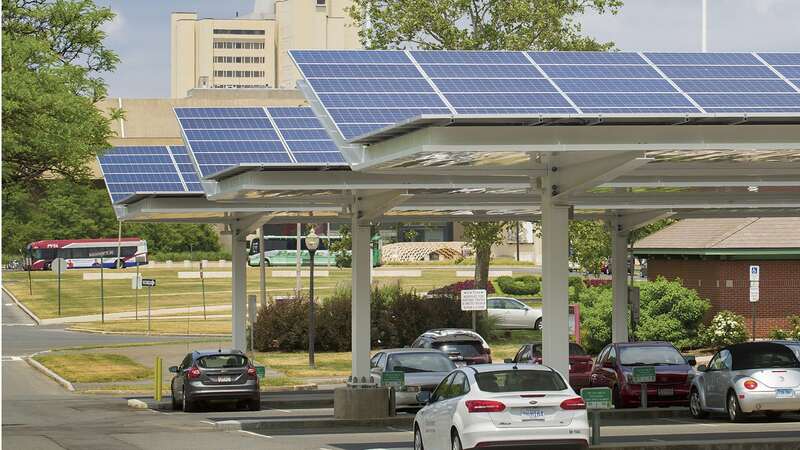 Officials at UMass say this matter has been thought through thoroughly and that there is tremendous opportunity for growth — if they move quickly and properly. He’s certainly right about the first part of that equation — there will be several established in a few years. As for the second part, we hope he’s right about that, too. But as several schools have already discovered, breaking into the online market is a challenging proposition. ADDFab Director Dave Follette with samples of 3D-printed objects. 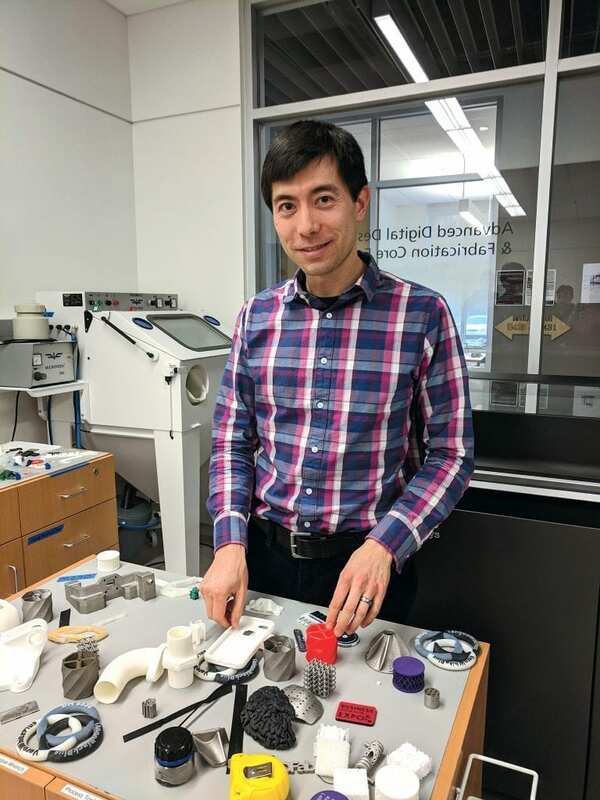 The Advanced Digital Design & Fabrication Lab, or ADDFab for short — one of 31 ‘core facilities’ in the Institute for Applied Life Sciences at UMass Amherst — is creating something significant in the manufacturing world, and not just the products it forms from metal and polymer powders. No, it’s also building connections between young talent and companies that will increasingly need it as 3D printing becomes more mainstream. And it does so with a focus — no, an insistence — on hands-on learning. It’s hard to learn about 3D printing, Dave Follette said, if you don’t have access to a 3D printer. ADDFab has five. And it likes to share them. In fact, that’s its mission. ADDFab, like the other core facilities, seeks to eliminate skills gaps between students and the work world with hands-on opportunities to use some truly cutting-edge and, yes, expensive equipment. ADDFab takes a similar tack with local businesses seeking to learn more about 3D printing, Follette added. Sundar Krishnamurty, ADDFab’s co-director, explained that the facility has three distinct but interwoven goals. The equipment itself is impressive — two metal printers and three polymer printers, each using different raw materials and different technologies to produce an endless array of products. 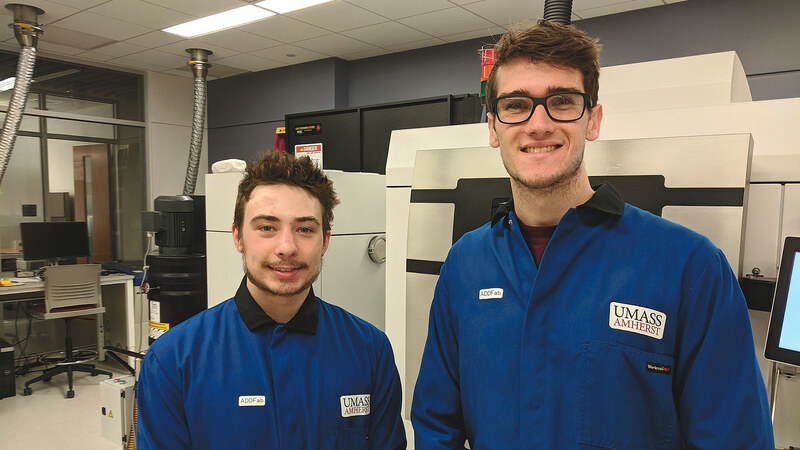 The facility supports UMass itself in several ways, as students and faculty can be trained to use the equipment to conduct their own research on additive manufacturing, while ADDFab also provides printing services and engineering support for faculty in all academic departments. But it’s the outreach to industry that may be most intriguing element, not just through those aforementioned workshops, which are intended to broaden understanding of how 3D printing will affect the manufacturing industry and to provide hands-on skills, but through a state-funded voucher program that gives businesses with fewer than 50 employees a 50% subsidy to access the core facilities, and 75% to businesses with fewer than 10. What happens when students are well-trained on cutting-edge 3D-printing technology, and when area manufacturers learn more about its potential, is clear, they both noted: Positive workforce development that helps businesses grow while keeping talent in Western Mass. 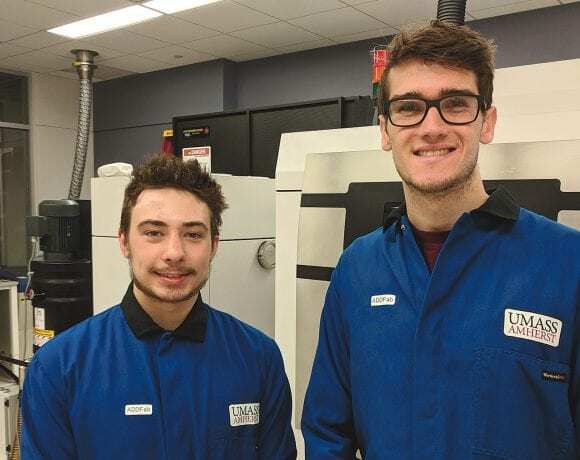 Jeremy Hall, now a senior at UMass, has been interning at ADDFab, and said the opportunities are positive on a number of levels, including setting students up for interesting careers in a fast-growing, but still largely undertapped, field. Jack Ford (left) and Jeremy Hall are two of the current student interns at ADDFab. Another intern, Jack Ford, is a sophomore whose interest in 3D printing began when he used similar — but not nearly as advanced — technology to create a tool in a high-school drafting class. There’s an energy-absorbing lattice piece on a table at ADDFab inscribed with the name of its creator, Adam Rice, who recently became one of the facility’s success stories, and an example of how it seeks to connect talent with need. After graduating in December, he now has a career of his own, at Lytron, a designer and manufacturer of thermal-management and liquid-cooling products based in Woburn. The brochure Rice appears in promotes the UMass Summer Undergraduate Core Internship Program, which allows students from the STEM fields to access hands-on training and experience in the core facilities, including ADDFab, over the summer. And even cooler to spin it into a well-paying job. Meanwhile, area companies — including, of late, Peerless Precision, Volo Aero, FTL Labs, Cofab Design, and MultiSensor Scientific — continue to take advantage of ADDFab’s resources, often through the voucher program, either to make 3D products or learn more about how to incorporate the technology. Responding to a commonly raised concern, Krishnamurty stressed that all intellectual property stays with the companies. Sundar Krishnamurty says ADDFab wants to partner with local industries to identify and fill workforce and training gaps. 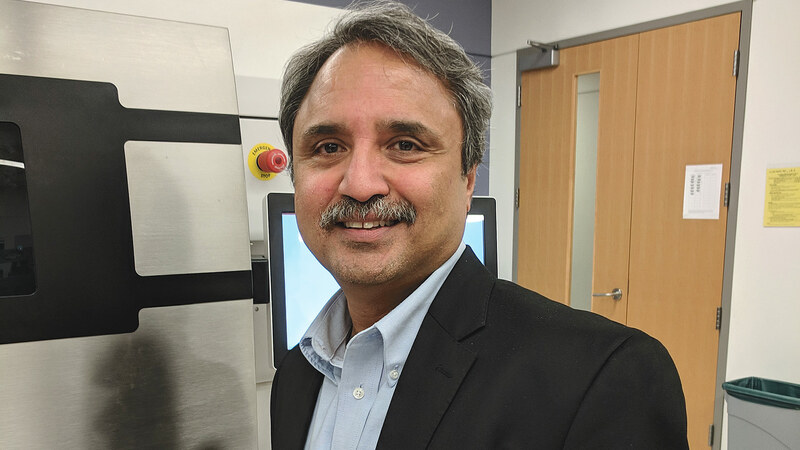 And if the facility can perform such services while training the next generation of engineers and boosting workforce development for the region’s manufacturing sector, Krishnamurty said, well, that’s a clear win-win-win. Nancy Buffone has three degrees from UMass Amherst and has spent her entire career working for her alma mater. The job titles and long lists of responsibilities have changed over the past 23 years, but the one constant has been that she loves — really loves — coming to work every day. As a manager, leader, mentor, and role model, she says it’s her mission to make all those on the teams she supervises feel the same way. Nancy Buffone says that as a manager — and as a leader — one thing she tries to do is put herself in the shoes of those she’s supervising. And in the case of younger staff members, that’s not a hard assignment, because she’s certainly been in those shoes. Indeed, not long after graduating from UMass Amherst more than 20 years ago, Buffone went to work for the institution in the Provost’s Office. A few decades later, she is associate vice chancellor of University Relations, a relatively new realm at the school, has two offices, and manages roughly 35 people handling a wide array of assignments, from planning commencement to putting out the alumni magazine to dispensing news. Putting herself in the shoes of those carrying out that work enables her to better understand their wants, needs, anxieties, and challenges, she said, and overall, it makes her a better leader and the offices she supervises better places to work. “If you don’t enjoy coming to work, it can be really hard to come to work every day,” she said, making an observation that essentially defines her approach to management. Becoming a more effective leader is one of the few things not actually listed on Buffone’s job description (we’ll get into what is a little later on), but professional development is something she takes very seriously. In fact, earlier in her career, while working for the university’s Provost’s Office, she developed a leadership program for academic department chairs — an initiative that filled what she saw as an enormous need. As part of her own professional-development efforts, she became a participant in the Leadership Pioneer Valley program, specifically as a member of its class of 2013. She said the experience not only provided her with a much better understanding of the four-county region — one of LPV’s stated goals — but helped her do something she said all good leaders need to do — step out of her comfort zone. In this case, that meant taking on the additional responsibilities of the Communications Department with University Relations, which effectively tripled her workload and the number of people she was managing. “This was something brand new, and there was a lot to the job,” she said. “It was a new challenge, and it was something just so out of the box, so out of the comfort zone for me. Her ability to move well beyond that comfort zone has been invaluable as she has taken on that ever-growing list of responsibilities, many if not most of which have to do with telling the university’s story — and telling it much better than it was told decades ago. In many respects, it’s better story to tell these days, said Buffone, who was in a particularly good mood on the day she spoke with BusinessWest because the new U.S. News & World Report rankings of the nation’s colleges had just come up, and the university had moved up a few notches in many of the categories. “We keep moving in the right direction,” she said, noting, for example, that the school moved up from 29th to 26th on the list of best public institutions, and from 75th to 70th among all schools. Meanwhile, her career has taken on the same general trajectory as the university’s. For this issue and its focus on women in business, we talked with Buffone about her multi-faceted role at the university, but moreso about the broad subject of leadership and her ongoing efforts to improve those skills. There are two large bowls of candy in Buffone’s office at the Whitmore Administration Building on the UMass Amherst campus. And it’s the same in her other office on University Drive, where the Community Relations staff is based. The candy serves many purposes, she told BusinessWest, noting that, in many respects, it is an icebreaker and a temptation that brings people to those offices, which they generally leave with more than a miniature Mr. Goodbar or Reese’s Peanut Butter Cup in their hand. Indeed, they also generally leave with a smile. “We work very hard at our jobs, so I want to laugh very hard while we’re working,” she said of her general approach to management and leadership. “I want to make sure we’re having a good time while we’re doing this. 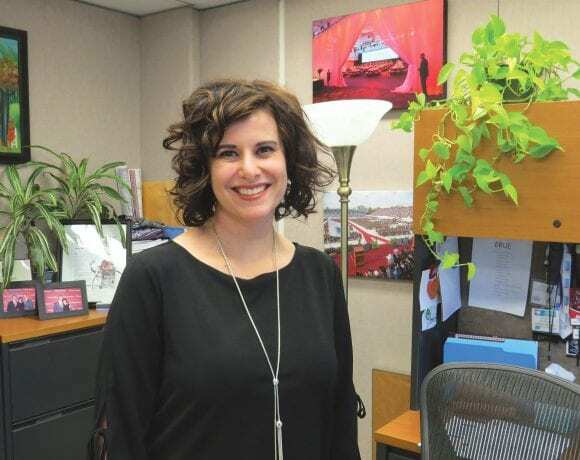 Stocking her office — and later her offices — with candy is just one of the traits Buffone has developed in a career that has seen her take on a growing list of responsibilities since she graduated from the university in 1995. As a student, she took a job working in the Provost’s Office (the provost is the chief academic officer on the campus) and had the opportunity to work for and be mentored by Judy Barker, who, as fate would have it, retired soon after Buffone graduated. She was offered a job approximating the one Barker held, thus commencing a 14-year stint in the Provost’s Office that turned out to be learning experiencing on a number of levels. That list included everything from working on a number of search committees for many senior administrative positions to creating new events on campus, working with the news office to promote faculty honors, and much more. Along the way, she worked for several provosts who also became mentors, and she also earned two more degrees, including a doctorate in higher education policy and leadership. She said she was given the opportunity by those provosts to take what she was learning in the classroom and apply it in the workplace, especially within the broad realm of leadership and, more specifically, the academic department-chair level. 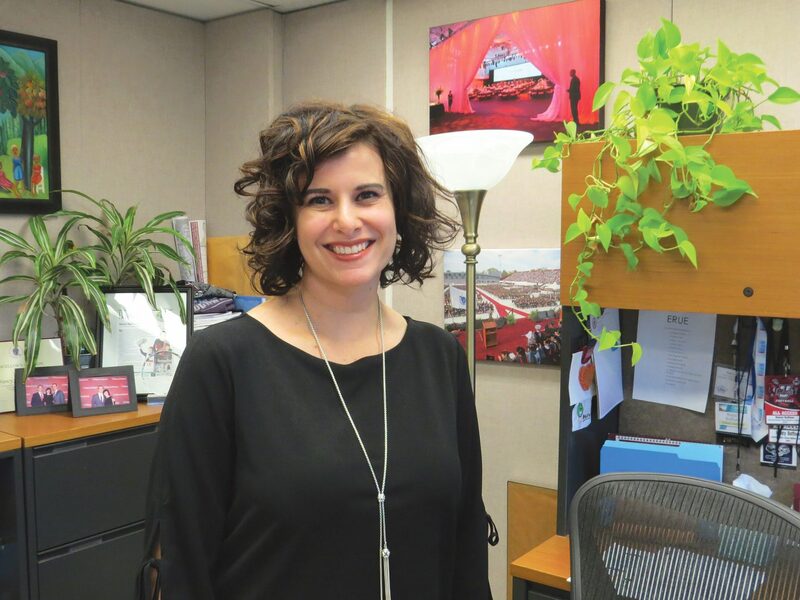 That program was among the hardest things to give up as Buffone moved on to the next chapter in her career in early 2009, as executive director of External Relations and University Events as part of the new University Relations department. 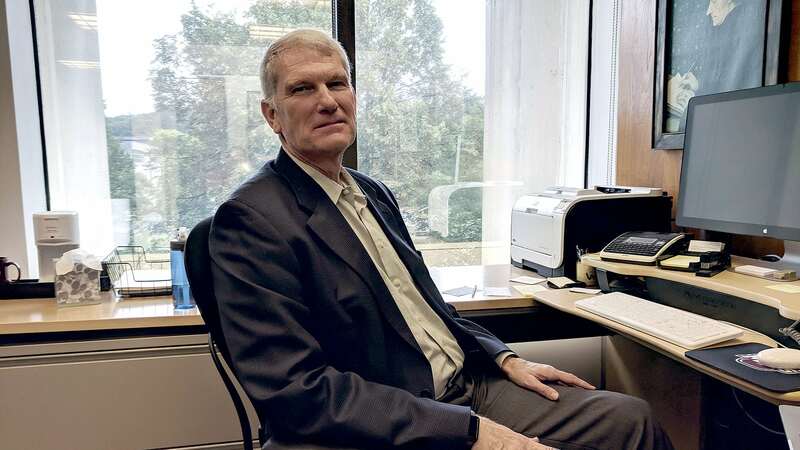 That office, created by then-Chancellor Robert Holub, is tasked with a wide variety of assignments, including community relations, events, media relations, federal and state government relations, and more. Early on, Buffone was placed in charge of events, with one of the first being the school’s 150th anniversary, a party that was several years in the making. These days, she leads two teams, one handing events and community relations and the other assigned to communications — a very broad term covering everything from the alumni magazine to the college website. As she said, the expansion of her duties and the title on her business card tripled her workload and put dozens more people under her supervision, giving her more opportunities to apply lessons learned in graduate school and also while working with and for many great mentors. When asked to describe her style of management, Buffone paused for a second before noting that she’s from New York (Long Island, to be more specific) and thus relies heavily on sarcasm. And then gave an example. Sort of. “I learned how to manage by making mistakes, and I try not to repeat my mistakes,” she said with a laugh. “I started small, managing one person, and then four, and then it grew seemingly overnight when I took on the communications team. But whatever the number is, it’s really about trying to understand what I can do for the people I work with every day to make their jobs easier. As for her own professional development, Buffone said her involvement with LPV enabled her to do something she really needed to do but was hard pressed to find the time for — doing some reflection on what she wanted to do and where she wanted to go professionally. Elaborating, she said that, through her LPV experience, she decided she needed to get more involved in her community (Amherst), and she has, serving as a town meeting member and as president of the Amherst Area Chamber of Commerce board. Meanwhile, at the office — or, again, at both her offices — she works hard at her job and equally hard at making sure people enjoy their jobs, something she believes is key to promoting creativity and, ultimately, better, more effective telling of the university’s many stories. That includes the staging of what she called ‘standing meetings,’ which are just that — 15-minute meetings, instituted about five months ago, in which the participants stand and, in this case, keep a huge inventory of individual projects (700 a year for the communications department alone, by Buffone’s estimate) on track. As have most of her initiatives, all aimed at not only getting the word out about everything going on at the school, but making everyone on the team as enthusiastic about their role as she is. 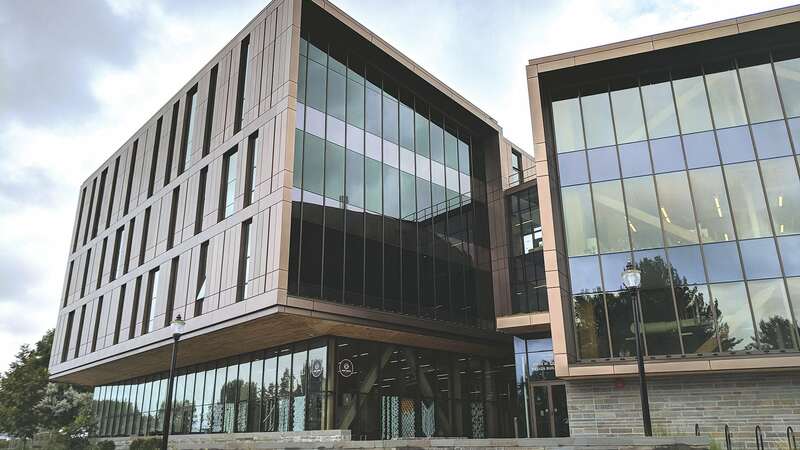 Unlike the university itself and several of its departments — from food service to the marching band — there are no rankings for communications and events departments. But there are still measures of success, and plenty of them, Buffone said, listing everything from letters to the editor of the alumni magazine (they show that the material is being read) to feedback on a host of events, to the sense of satisfaction showed by her team members when one of those events is over. Another measure might be how many times she has to fill those candy bowls — which is often. That shows that people are breaking the ice, coming into her offices, communicating, and enjoying their hard work. Which, at this university and within this department, is an effective course of action — literally and figuratively.